At SAP we always try to showcase our software in real life situations. To demo IoT scenarios it is a bit unhandy to setup large scale factories. However in some situations it is sufficient to show a little sensor connected to some kind of developer board. Typically you would like to see how SAP software interacts with a more complex model. For those kind of demos we have chosen Fischertechnik due to its flexibility and ease of use. For those of you who don’t know Fischertechnik, it is a German company selling construction kits. It is the same company producing Fischer wall plugs. Before we get into all the technical details, I am going to explain a little about the Fischertechnik models we have used and the business scenarios implemented in SAP systems. Fischertechnik construction kits are available in a wide range of different varieties. 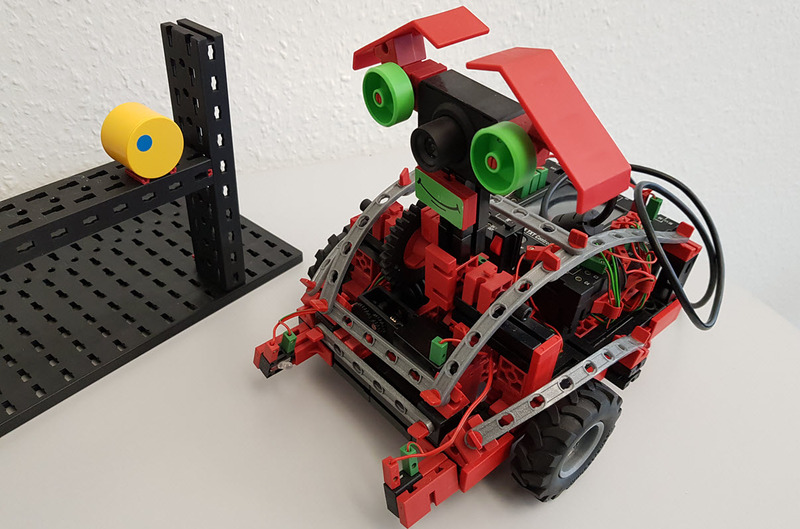 Kits for very specific purposes, like kits to build an autonomously driving robot, or a full production line of a factory can be bought at many retailers. The construction blocks all use the same logic, hence you can mix different kits and can come up with your very own models. 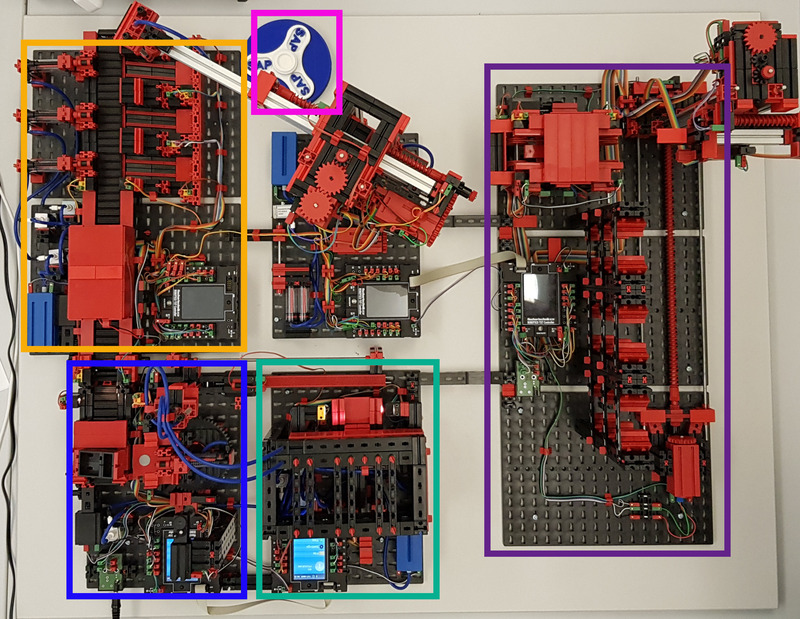 These kits are often used in schools and universities to learn about simulation, business processes or IoT. Here at SAP we have already used a few of these kits to build compelling demos for our customers. 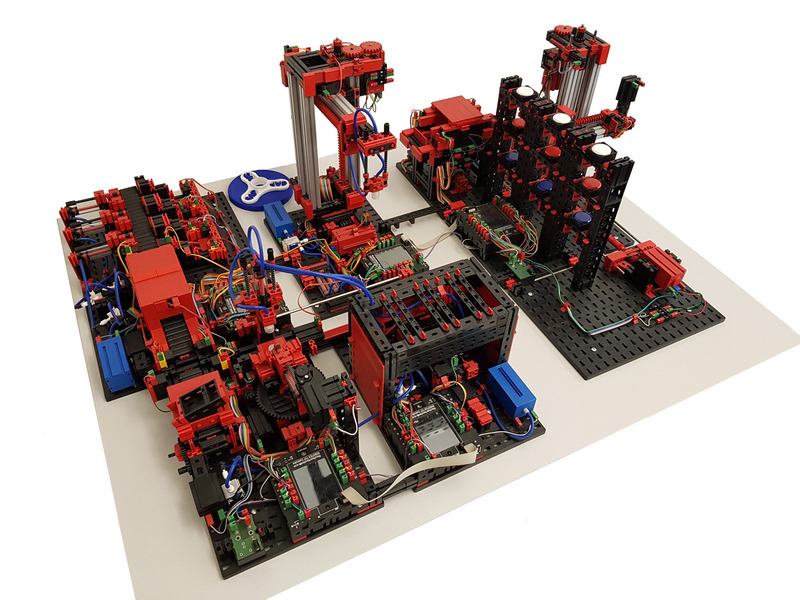 I would like to introduce you to two of these models in a little more detail, the inspection robot and the factory simulation. In the picture above you see such an inspection robot. We hooked this robot up to the SAP Cloud Platform (SCP) and were able to control it from there. On a mobile device we have a remote control to steer the robot. In addition we have a dashboard to view the video stream of the camera. The robot’s task is to measure the size and position of drilling holes. In the background of the above picture you see a yellow barrel with a blue dot. The blue dot represents a drilling hole. The camera sends the video stream to SCP. Then on SCP we use a computer vision service to analyze the pictures. That service returns the diameter and position of the drilling hole. The operator using the dashboard has then the option to decide if the hole is within its specifications. If it is we can analyze the next object, if it isn’t the dashboard allows us to create a work order in a connected SAP S/4 Hana system. 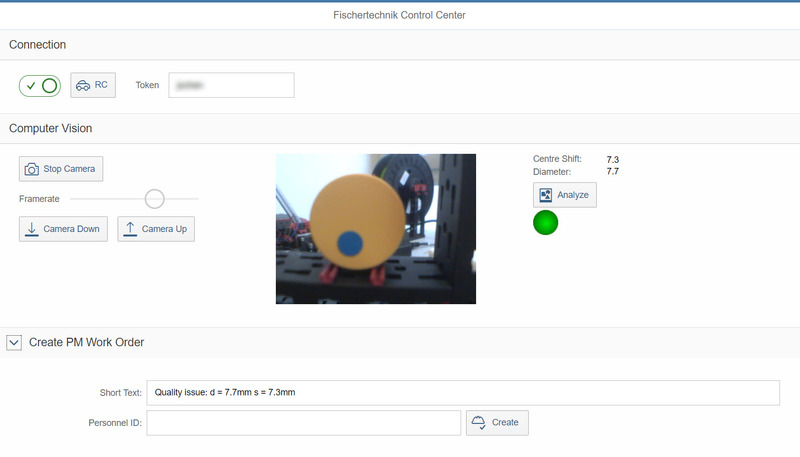 Below is a sample picture of the robot’s dashboard to give an impression how something like this might look like. The above picture shows the factory with all its parts. You can spot a warehouse on the right, the production line at the bottom and the assembly line on the left. Furthermore a crane to connect the different stations is placed in the center. We use this factory model to show the production process of lot size one. The story behind that model is the manufacturing of fidget spinners. To get a better understanding of the different components and the business process we can take a look at the picture below showing a bird’s-eye view of the factory. In purple frame in the picture above you see a warehouse. This warehouse holds the bearings for the fidget spinners. The warehouse system can transport one of the bearings to the exit of the warehouse. The large crane in the center of the factory picks it up and delivers it to a furnace. The furnace, as seen in the green frame, simulates the hardening of the bearing. After that the piece is being transported to the polishing station (blue frame) to give it a nice finish. After the polishing is done, a conveyor belt transports the bearing through a color sorter and into an output bin. The large crane picks up the bearing from one of these output bins and places it into its 3D printed casing. The casing can be found in the pink frame. In our showcase we have a web shop where a customer can order such a fidget spinner. The order in the web shop triggers the creation of a production order in S/4 Hana cloud. Once the production order has been released, it is transferred to SAP ME. SAP ME then finally triggers the Fischertechnik factory. If would like to watch a little video of the full process take a look at this video (in German language), the Fischertechnik Demo starts at 26:45. Another blog post with a little video (in English language) can be found on news.sap.com. In part 4 of this series of blog posts we will explain in detail how to run this model with an integration into SAP. There we will give also an example of a dashboard to monitor this factory simulation. In the next part of this series we are going into the technical details of the demo connector for Fischertechnik and explain how you can use it for your own projects. Read on in part 2 of our blog post series.